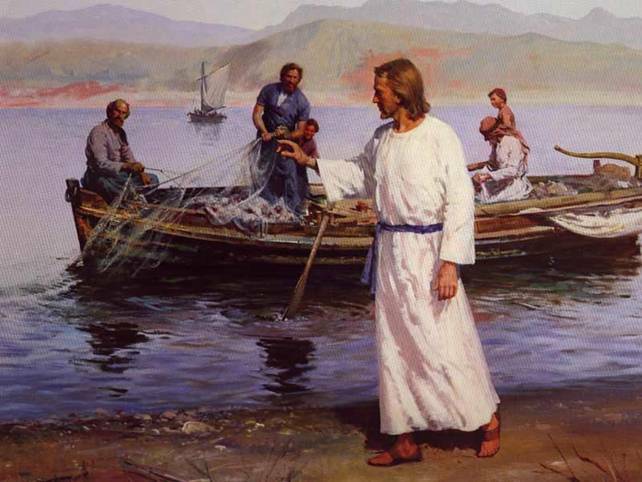 “As Jesus was walking by the Sea of Galilee, he saw two brothers, Simon who is called Peter, and his brother Andrew, casting a net into the sea; they were fishermen. He walked along from there and saw two other brothers, James, the son of Zebedee, and his brother John. He called them,and immediately they left their boat and their father and followed him.” – Matthew 4:18-22. Saint Andrew was one of the fishermen of Bethsaida, and was the brother of Saint Peter. 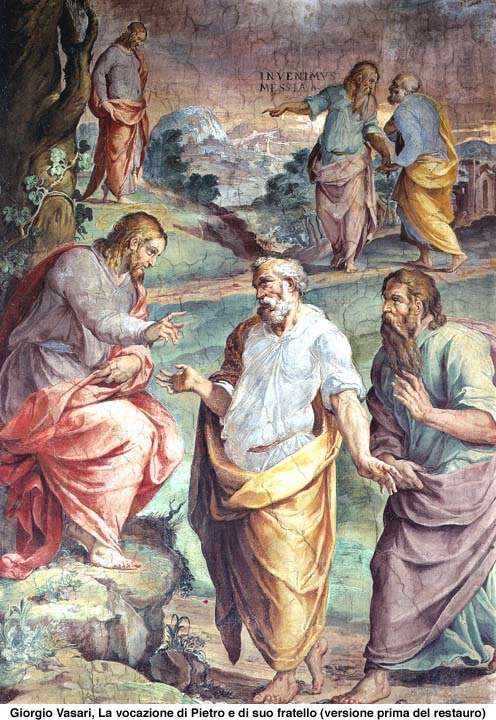 He became a disciple of Saint John the Baptist. When Saint Andrew first caught sight of the gibbet on which he was to die, he greeted the precious wood with joy. O good cross! he cried, made beautiful by the limbs of Christ, so long desired, now so happily found! Receive me into thy arms and present me to my Master, that He who redeemed me through thee may now accept me from thee! Reflection: If we would do good to others, we must, like Saint Andrew, receive our cross with loving gratitude and not desire to be separated from it, until God so wills. To take up our cross is Jesus’ command; are we perhaps dragging ours? The small town of Montebrandone, on the eastern coast of Italy, called the March of Ancona, gave birth to this Saint in the year 1391. While still young he was sent to the University of Perugia, where his progress in learning soon qualified him to be chosen preceptor to the children of a young gentleman of Perugia. He went with him to Florence, to aid in the administration of a juridical office the nobleman had obtained there; but realizing that he was about to be engulfed in the whirlpool of worldly excesses in which he found himself, Saint James applied himself to prayer and recollection, and thought of entering the Carthusian Order. When traveling one day near Assisi, however, he went into the Church of the Portiuncula to pray, and moved by the fervor of the holy men who there served God and by the example of their blessed founder Saint Francis, he determined to petition in that very place for the habit of the Order. He was then twenty-one years of age; he received the habit near Assisi, at the convent of Our Lady of the Angels. 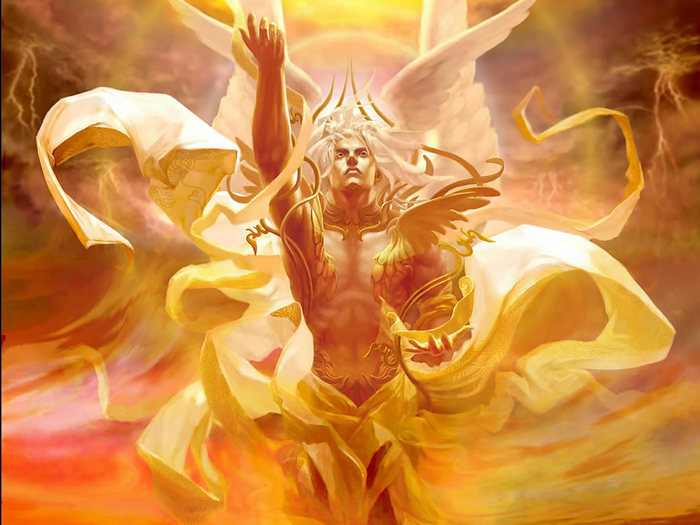 He began his spiritual war against the world, the flesh and the devil in prayer and silence in his cell, joining extraordinary fasts and vigils to his assiduous prayer. He fell ill with a number of different illnesses which for thirty years he endured with heroic patience, without ever exempting himself from saying Holy Mass or assisting at the offices in common. For forty years he never passed a day without taking the discipline. 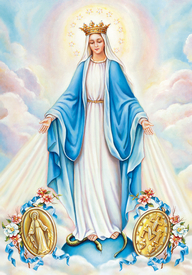 When, through the response of the Mother of Heaven to his prayers, he became able to preach, he carried out that ministry with such great fervor and power that he never failed to touch the most hardened hearts and produce truly miraculous conversions. He joined Saint John of Capistrano to preach a crusade against the Turks, who had become masters of Constantinople and were terrorizing Western Europe. At Buda he effected the miraculous cessation of a furious sedition by simply showing the crucifix to the people; the rebels themselves took him upon their shoulders and carried him through the streets of the city. At Prague he brought back to God many who had fallen into error, and when a magician wanted to dispute with him, he rendered him mute and thus obliged him to retire in confusion. He traveled through the northern Provinces, into Germany, Dalmatia, Hungary, Poland, Norway and Denmark and many other places; he went without any provisions other than his confidence in God. If he found no aid or was without lodging he rejoiced in his union with Lady Poverty, to whom he was joined by his religious profession. 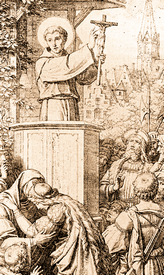 When he was called back to Italy to labor against a heresy, he acquired new persecutors who attempted in several ways, including ambushes, poison, calumny and the arousing of seditions against him, to do away with him. But God delivered him each time from the most adroitly conceived artifices. When chosen as Archbishop of Milan, he fled, and could not be prevailed on to accept the office. He brought about several miracles at Venice and at other places, often by the simple Holy Name of Jesus written on a paper. He raised from dangerous illness the Duke of Calabria and the King of Naples. The Saint died in the Franciscan convent of the Holy Trinity near Naples, to which city the Holy Father had sent him at the prayer of its King, Ferdinand. The date was the 29th of November of the year 1476; he was ninety years old, and had spent seventy of those years in religion. 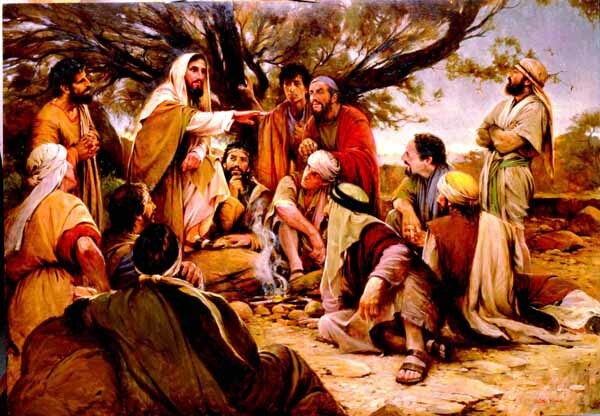 Heaven and earth will pass away, but my words will not pass away.” -Luke 21:29-33. 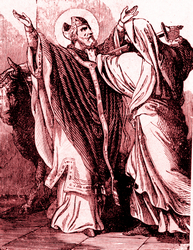 When Saint Saturninus went with Saint Peter to Rome, the Apostle was inspired to send out a number of fervent evangelists to the West, to dissipate by the light of Christ the darkness in which those regions were still plunged. Saturninus was directed to go to what is now southern France, to Toulouse in particular. Saint Peter consecrated him a bishop, that he might form and ordain native priests for the future Christian churches of Gaul. He was given for his companion Papulus, later to become Saint Papulus the Martyr. The two companions acquired at Nimes an ardent assistant in the person of Honestus. At Carcassonne, when the three announced Christ they were thrown into a prison, where they suffered from hunger; but an Angel was sent by the Lord to deliver them, and they continued on their way to Toulouse, preaching the doctrine and the name of Christ publicly. This caused great astonishment, and the cause of the silence was sought. Saint Saturninus in the meantime was working miracles which produced a strong impression on the witnesses; among them, the cure of a woman with advanced leprosy. For a time he left his two disciples there and continued on elsewhere, preaching in the cities of what are now Auch and Eauze. A Spaniard heard of him and crossed the Pyrenees to hear him; this man, by the name of Paternus, advanced so rapidly on the paths of virtue that Saint Saturninus ordained him and then established him bishop of Eauze. The idols again became mute. One day a great multitude was gathered near a pagan altar, where a bull stood ready for the sacrifice. A man in the crowd pointed out Saturninus, who was passing by, as the cause of the silence. There is the one who preaches everywhere that our temples must be torn down, and who dares to call our gods devils! It is his presence that imposes silence on our oracles! An Angel appeared to him to fortify him, and the terrible flagellation he endured could not alter his firmness. I know only one God, the only true one; to Him alone I will offer sacrifice on the altar of my heart… How can I fear gods who you yourselves say are afraid of me? He was tied by a rope to the bull, which was driven down the stairs leading to the capitol. His skull was broken, and the Saint entered into the beatitude of the unceasing vision of God. Behold, She said, the symbol of the graces that I bestow on those who ask Me for them. The jewels which remain in the shadows symbolize the graces that one forgets to ask Me for, the Virgin continued. And Catherine Labouré wrote later, She made me understand how generous She is towards persons who pray to Her, how many graces She grants those who ask Her for them, and what joy She has to bestow them! Sister Catherine Labouré beheld this vision with happiness. A voice said to her: Have a medal struck on this model; the persons who will wear it will receive great graces, especially if they wear it around the neck. These graces will be abundant for those who wear it with confidence. The picture seemed to turn around, and Sister Catherine saw, on its reverse side, the letter M surmounted by a little cross, and below it the holy Hearts of Jesus and Mary, the first surrounded by a crown of thorns, and the second transfixed by a sword. Sister Catherine faithfully accomplished the mission Heaven had entrusted to her. In 1832 the medal was struck and immediately underwent a extraordinary diffusion throughout the world, accompanied by unceasing prodigies of cures, protection and conversion.